So on Tuesday night the husband took me to Best Buy to purchase me an iMac, before that however he said he would rather buy me a cheeseburger over spending that much (he loves to save money, it's like leveling in a video game to him lol). Anyway he decided instead to deny me a cheeseburger and actually buy me the iMac, needless to say I was excited because I'm always stealing his to do my tutorial editing on. Anyway we proceeded into Best Buy and waited patiently for like 10 minutes for someone to help us only to find out they did not carry the better one in stock. Long story short I was denied both a delicious cheeseburger AND the iMac... it was a sad night and I finished it off by saying "Noooooooooo!! Denied!" and laughed that it was a night of "Fail". Anyway we had planned on heading off to the Apple store on Saturday instead which is an hour drive from our house. I was disappointed in waiting but didn't mind greatly because I knew I was going to have it eventually. So anyway yesterday the husband comes over to me at work and says he's leaving for the day because he's feeling really sick, his face was red and he really did not look well at all. So I go about my day and patiently wait for the night to be over so I can get home to take care of the husband. I also had no ride home because we currently only have one car which normally isn't a huge deal since we work at the same place. Currently we have one of our friends living with us and he also works at the same place we do so he ended up come back to work to pick me up. On the way home he advised me that we had to stop at a restaurant and pick up the food my husband had ordered for himself, we picked up the food and on the way home he told me how sick my husband looked and that he had been sleeping the whole day. So I got home took the food into the bedroom to check on the husband then proceeded to walking into the computer room and put my things on my desk like I normally do. 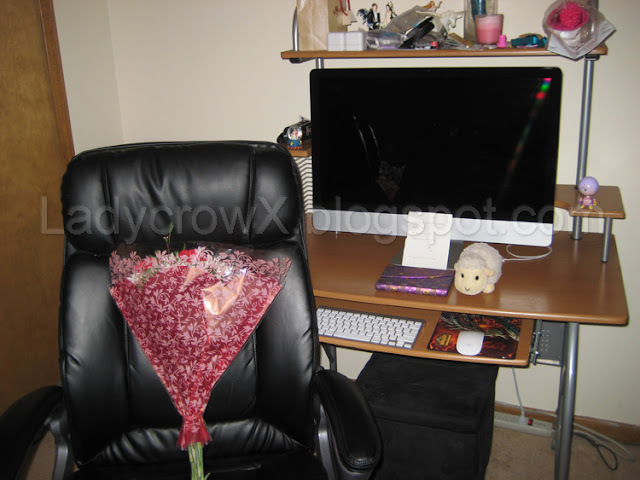 I walked in noticed the my desk was all straightened up and in my chair there was a bouquet of flowers and a note on my desk. Mind you the lights were out and only the hallway light was shining in so I couldn't really see things too well. I glanced over the note and smiled and starting saying how sneaky the husband was for getting me something early. He proceeded to tell me to go look again so I walked in and he turned on the computer room light and I FINALLY noticed that I had a brand new iMac sitting on my desk lol. What a cute story! Enjoy your new iMac! @Luna Yeah, it was either the iMac or a Nikon since I've been telling him I need one (I only have a canon Powershot SD750 from like 6 years ago). 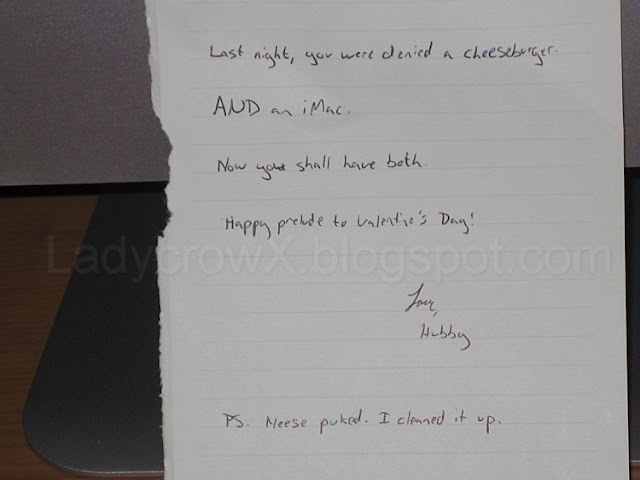 @femptur I laughed so hard when I read that part because it was so random in such a sweet note lol. Awwwww....sweet! He could teach my husband a thing it two! Awww. And cleaning puke? You have a winner!